In 2001, CatholicBoy.com was honored to offer "River Jordan" as an exclusive, limited edition broadside (poster). The text of the poem is set by hand using a manual printing press, with brown ink on fine sepia-colored paper (approx. 8.5"x15"). The poem is illustrated with a hand-set linoleum cut drawing in blue ink. Note: color variations in the images below are the result of variations in lighting. This broadside comes straight from Jim Carroll himself (rather than through a publisher), and it is limited to 151 copies total. Of these, 75 are numbered and signed by Jim Carroll; all of the numbered/signed copies have been sold. The 75 unnumbered broadsides include 40 unsigned copies and 35 signed copies. 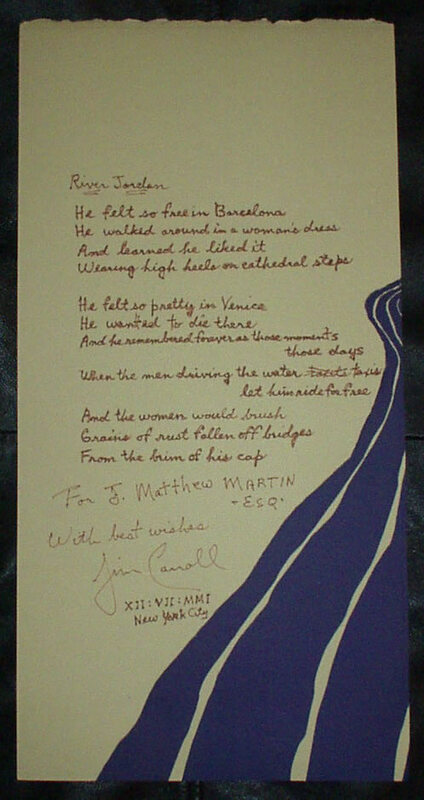 One copy of the broadside was handwritten and signed by Jim Carroll.